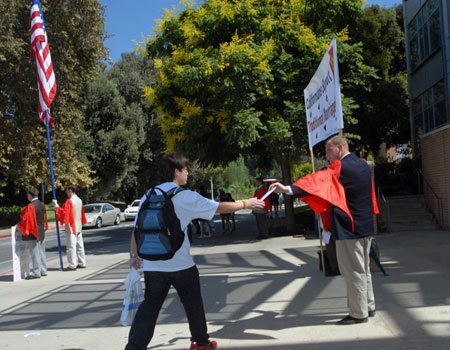 We had a fruitful campaign today at the University of California, Riverside campus. 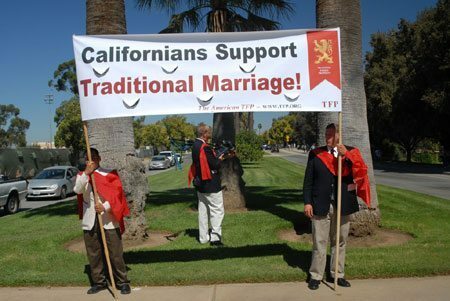 A large percentage of students walking to and from classes took a copy of our traditional marriage flier. As we travel, many people are interested to know if our tour is meeting success and making a difference. The answer is “yes,” based on two observations. First, those who oppose traditional moral values literally go ballistic when they see us in action. If our campaign had no impact, why would they be so visibly disturbed? Second, the bold, peaceful and polite public stand of the TFP makes it easier for folks to break out of the artificial bubble of political correctness and proclaim the truth in their communities. “I want to thank you so much for doing this at my university. Where can I find out more about your group?” asked a student. Twenty six days into our tour, I am glad to report that the spirits and morale among my TFP colleagues is high and ready to continue. We count on your prayers and support as we head off to San Diego. Saint Joseph, patron of this campaign, pray for us!